The Bayview trailhead is located at the Bayview YMCA (1601 Lane Street, San Francisco, CA 94124). It is one of three community trailheads in San Francisco, created out of a partnership with the YMCA. Volunteer in the parks! It’s fun. It’s healthy. It makes a difference. There are opportunities for individuals and groups – and it’s easy to get started. Join Healthy Parks, Healthy People for free, easy, and family-friendly nature walks. Launch a career in the parks with an internship – there are opportunities in every field, from natural resources to maintenance to education. Get trained as a CAP (Camping at the Presidio) leader and bring your community groups camping in the national parks. 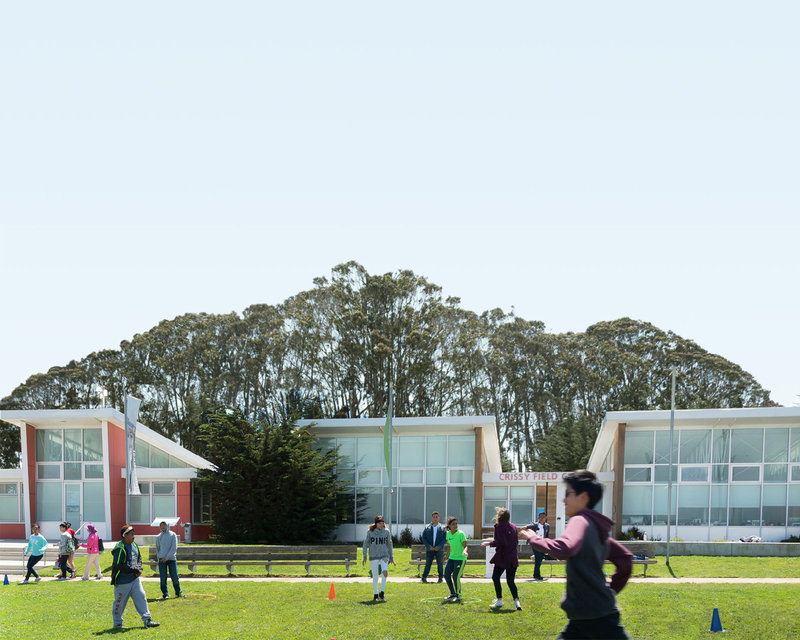 Enroll your kids in a summer camp or youth program at the Crissy Field Center and YMCA. Scholarships are available! Bring the s’mores, stories, and national park experience right to your neighborhood with the Parks Conservancy’s Community Campfire Program. Enjoy free exhibits, family programs, music, and lectures at San Francisco’s most historic building, the Presidio Officers’ Club. Find your park. America’s national parks are as unique and varied as the people who visit them. What’s your park? Time to find out. What: A former military post, the Presidio is now a stunning national park with beaches, forests, history, and trails. To Do: Learn about the Buffalo Soldiers. BBQ by the beach. Rent a bike. Walk in the woods. Glimpse rare birds and native flowers. Go fishing at Crissy Field. What: This is San Francisco’s iconic and international (orange) landmark. Who doesn’t have a soft spot for this beauty? To Do: Walk or bike across the 1.7-mile span. Grab coffee in the Plaza and watch the fog roll in. Learn about the design and engineering of the span in the Bridge Pavilion. What: Where the city (and continent) meet the ocean, Lands End is a wild and rocky landscape with history and a bit of mystery. To Do: Start your visit at the Lands End Lookout Visitor Center. Walk down to the epic ruins of the Sutro Baths. Look for seals, whales, and shipwrecks. Hike along the Coastal Trail. What: It’s you, the waves, and sea birds at Ocean Beach – a sandy stretch on the westernmost edge of San Francisco, adjacent to Golden Gate Park. To Do: Take a stroll. Fly a kite. Check out the surfers. Build a sand castle. Watch out for rip currents and be aware of changing tides and weather conditions. What: Nature and community come together at Mori Point, an important Ohlone site and home to a variety of native wildlife. To Do: Walk barefoot on Sharp Park Beach. Catch the beautiful wildflower blooms in the spring. Explore the hillsides with a challenging hike and enjoy the Pacific view from the Promontory. What: Perched at the highest point of Bayview Hill, Hilltop Park is a neighborhood favorite with its 70-foot sundial and San Francisco’s first skatepark. To Do: Enjoy a picnic with friends and family. Coast down a cement slide. Bring your skateboard and ride to your heart’s content. What: Heron’s Head Park encompasses 22 acres of open space thriving wildlife habitat. The wetland attracts more than 100 bird species a year and is a center for ecological education. To Do: Walk the trails and take in the fresh Bay air. Go birdwatching with A Field Guide to 100 Birds of Heron’s Head (free online). Learn about living roofs, rainwater harvesting, and more at the EcoCenter. What: Practice your lay-up, perfect your jump, or run around freestyle at this community park. There’s a play area for little ones and programs at the community clubhouse too. To Do: Play soccer, softball, basketball, and tennis – the fields and courts are lit up at night. Pack snacks and have a picnic. For more information about the Bayview Trailhead, please call (415) 561-3054 or email trailsforever@parksconservancy.org.